The MCP1653 is a 750 kHz gated oscillator boost controller packaged in an 8 or 10-pin MSOP package. Developed for high-power, portable applications, the gated oscillator controller can deliver 5 watts of power to the load while consuming only 120 µA of quiescent current at no load. 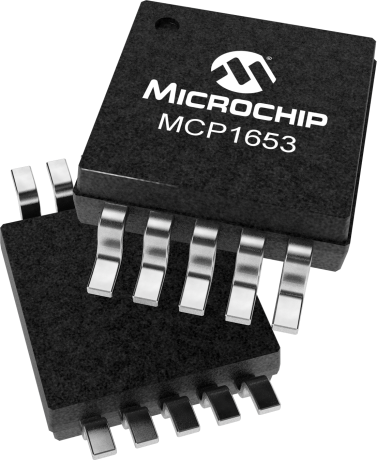 The MCP1653 can operate over a wide input voltage range (2.0V to 5.5V) to accommodate multiple primary-cell and singlecell Li-Ion battery-powered applications, in addition to 2.8V, 3.3V and 5.0V regulated input voltages. The MCP1650 SEPIC Power Supply Demo Board is used to evaluate Microchip’s MCP1650 boost controller in a low power application that requires a regulated output voltage from an input source that can be greater than, less than, or equal to the output voltage. As provided, the MCP1650 SEPIC Power Supply Demo Board generates a 5.0V output from a 3.0V to 7.0V source.